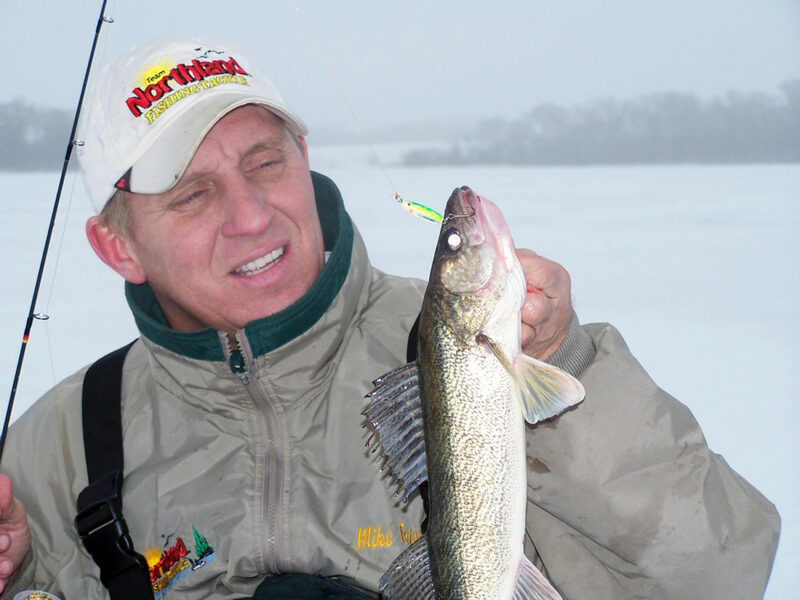 — Submitted photo Mike Frisch got this walleye to eat his Buck-Shot Rattle spoon under the ice. Ice-anglers have a good number of different baits and bait styles available to them. One of the most popular and effective bait styles for ice-fishing is spoons. Look in the tacklebox of almost any angler who fishes through the ice and you’ll find at least a couple and probably quite a few spoons. Across the ice-fishing belt, anglers use spoons to catch a wide variety of fish. When it comes to walleyes, crappies, and perch, spoons are very popular and effective. Here are some ideas for selecting a spoon that will help put more fish on the ice. Spoons come in all colors, sizes, and shapes. You might wonder what the difference is in the various spoons, and if those differences really matter. They do! When the fish are hungry and willing to bite, they’ll eat just about anything you put down there. But when they get finicky, spoon shape, color, and action can be the difference between catching and not catching. Spoon size is a very important consideration. Remember that weight and physical size are two different things. You could have a spoon made of a lighter material be much larger physically than a spoon made of lead but weigh about the same. The Buck-Shot Rattle Spoon, one of the best spoons for ice-fishing ever made, is smaller in physical size than a metal spoon of a similar weight. Generally in spoons like the Buck-Shot, if you’re after walleyes, the eighth ounce size is probably as small as you would want to start with: The quarter ounce size is usually a good starting point. For perch and crappies, start at the eighth ounce size. If they don’t go for that, work smaller. Usually the sixteenth ounce size is as small as you need to go for perch or crappies, but you never know. Next consider color. In dark water, brighter colors are usually a good idea, but again, not always. In clear water a more natural color is often a good start, but you never know. Keep trying different colors until the fish show you what they want. Spoons that glow have been around for a long time. 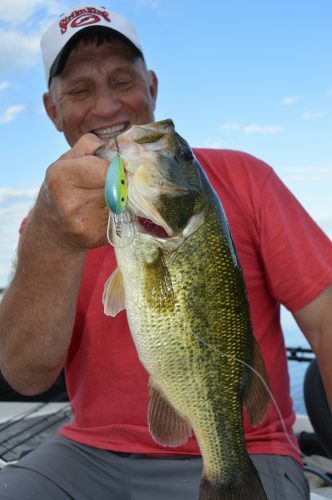 When they first came out, anglers wondered if a “glowing” spoon really helped catch more fish. 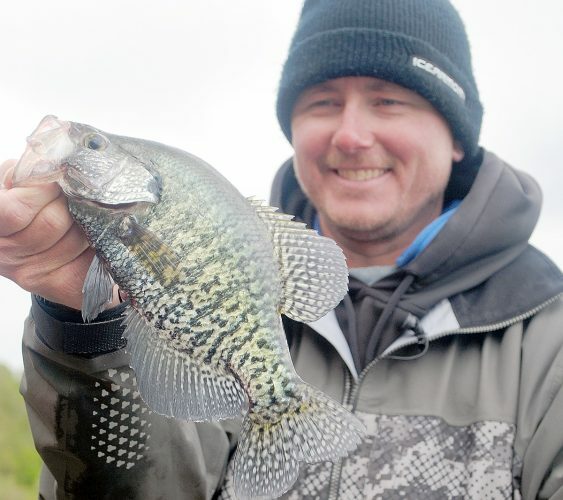 I had the same question, and it was clearly answered on a trip to Upper Red Lake in northern Minnesota during a crappie boom that was occurring on Upper Red. I was with John and Duane Peterson from Northland Fishing Tackle and they were just starting to experiment with glow paint for their baits. Upper Red has very stained water: At the time visibility was less than a foot. We shined a little blacklight flashlight at the baits to make them glow, then lowered them into the water. The crappies really liked them, at least for about twenty minutes. Then, although we could see fish looking at our baits on our sonar, they quit biting. The glow had worn off. We recharged the spoons and the crappies immediately started eating them. I’ve seen the same thing happen with perch and walleyes many times as well. Glow does help sometimes. Spoon action is another consideration. Some spoons fall straight up and down, others flutter. Sometimes the fish like a fluttering spoon, other times they like less action. Presentation may be even more important under the ice than it is in open water. Remember, the fish can really get a good look at your bait under the ice. Give them the bait they want they way they want it and you’ll be a more successful ice angler.